Unforgettable Experience – Horseback Riding in Costa Rica! Horseback riding in Costa Rica carries a very strong tradition. Horses have always been a part of Costa Rican culture, especially in Guanacaste where you can still see the occasional cowboy riding through the city of Liberia. In that sense, going on a horseback riding tour will offer you a cultural experience as well as an enjoyable one. You can ride through an untouched rainforest trail and spot howler monkeys, sloths and scarlet macaws, or you can trot along the sandy shorelines while enjoying a stunning sunset view. 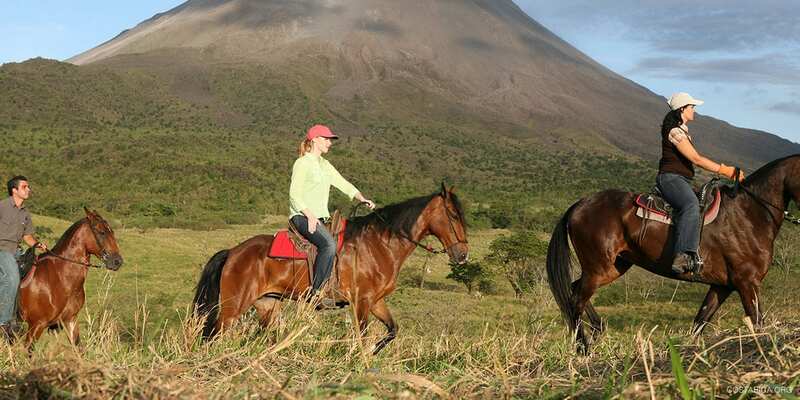 Discover all the ways you can enjoy Costa Rica on horseback! The province of Guanacaste holds a very strong tradition in cattle farming as part of Costa Rica’s ‘Wild West’. Rincon de la Vieja National Park is one the absolute top locations for horseback tours in light of this tradition as well as the wide range of flora and fauna to be found in the park. You can ride along the diverse trails and discover waterfalls and mineral pools. You will get a chance to spot birds and monkeys as well as the national flower of Costa Rica, the Guaria Morada. You can even delve deeper into Costa Rican culture and combine some of the park’s most popular attractions with a visit to a real cattle ranch. The Monteverde Cloud forest is one of the most iconic sites in Costa Rica. Exploring this national park on horseback will take you through the thick jungle as well as wide open coffee plantations. Tours can last from a couple of hours to eight days. Speaking of iconic, what about Costa Rica’s famous conical beauty as the backdrop of your horseback tour? Explore the rainforest, La Fortuna Waterfall and Lake Arenal! Whether you favor the Pacific or Atlantic coasts, pretty much all of Costa Rica’s beaches become even more magical when explored on horseback. Especially when you take a sunset tour! Some of the best places have to be the beaches on the Nicoya Peninsula, famous as one of the Blue Zone areas in the world. Playa Samara is similar to a hippie commune where the tour horses trot the far edges of the beaches freely after tours. Or perhaps you would like to test your horsemanship on the Caribbean coastlines and visit Cahuita or Puerto Viejo where you can explore the beaches as well as the tropical forest surrounding it. Whichever beach you choose, your riding experience will be enriched by the fresh sea air and stunning sunsets. Both the guide and your riding horse are very well trained and the slow-paced tours allow for a relaxing time to view the scenery around you. The guides choose the best trails for their group and help you out when needed. The guides will provide you with a helmet. Then, after a small riding lesson where you will get a feel for your horse and your abilities, you can get started on your adventure! Don’t forget that the safety should also extend to the wellbeing of your horse. Although most Costa Rican companies will be pretty good about the care of their horses, make sure you check up front if they are well-treated and well fed as well as rotated regularly so they don’t work too much! When riding, make sure to wear sun protection, closed shoes and long pants. For the jungle tours, add some bug repellent to the list. And don’t forget to bring your camera for the best of wildlife and nature shots! Horse riding tours are culturally significant as well as relaxing and are a great way to discover the beautiful Costa Rica. Contact us for more information and let us help you make your next horseback riding vacation a reality!